Go Medina County representatives met on January 12th in Natalia to discuss strategies that will bring jobs and economic growth to the County, and had a comprehensive conversation on the County employment landscape. A presentation also highlighted plans for enhancing its GoMedinaCounty.com and launching social media campaigns. The next meeting will take place on March 9th in Hondo at the South Texas Regional Training Center. National Night out – an annual campaign that promotes safety and cooperation between the community and the police – was a booming success in Castroville. More than 200 people attended including Congressman Hurd and local politicians. SGRR hosted a booth and handed out 60 railroad themed bags with notepads, pens and koozies. Additionally, booth operators played games with kids and handed out prizes and candy. It was truly a great family time for all. Southwest Gulf Railroad Company would like to congratulate all Hondo ISD schools and teachers who recently received grants. Grants will help to bring new classroom programs, bolster the curriculum and provide for innovative educational materials. Southwest Gulf Railroad was proud to contribute to the Hondo Education Foundation and help bring the creative ideas of teachers and students to life. Hondo Little League is always a blast! For more information about the league or to get involved, please contact Hondo Little League President, Steve Wilson at [email protected] You can also visit hondolittleleague.org. Rep. Murr (L) pictured with Cynthia Prieto, Southwest Gulf Railroad Community Liaison. On Wednesday, September 14, State Representative Andrew Murr hosted an open meeting at the Hondo Public Library. Community members were invited to attend and discuss the issues, as well as priorities for the next legislative session. Looking to make a career move? Are you a college graduate searching for that first job? You will find a sense of community at Vulcan corporate headquarters, in one of our regional offices or at any of the hundreds of site operations located from California to the East Cost and from Illinois to Florida to the Yucatan Peninsula of Mexico. Visit our careers site to learn more about Vulcan Materials Company and employment openings. All applications are accepted online at vulcanmaterials.com/careers. Click new user and follow the instructions to register. Choose job openings from the menu options and search for a job that fits your interests. Select apply to begin your application. If you need assistance applying for a position, please call the Vulcan Materials Company Career Line at (205) 298-3175 or e-mail [email protected]. Congratulations to the newest member of the Rotary Club of Hondo – D’Hanis, Diane Cumpian. Diane is also the owner of Blooms & Blossoms, one of our past featured businesses located in Castroville. Vulcan Materials Company Touch-A-Truck was a rousing success at the Hondo July 4th picnic. Thanks to everyone who stopped by to explore the awesome construction and cement-mixing vehicles. The Hondo -D’Hanis Rotary Club 2016-2017 Executive Officers. Recipients of the Distinguished Service Citation and President’s Honor Roll for “Service to our Club and Community”, including Southwest Gulf Railroad Company’s Cynthia Prieto (pictured second from left). Vulcan Materials Company and Southwest Gulf Railroad made second installments of $1,000 each to the Legends of the Library – Judge James E. Barden Learning Center. 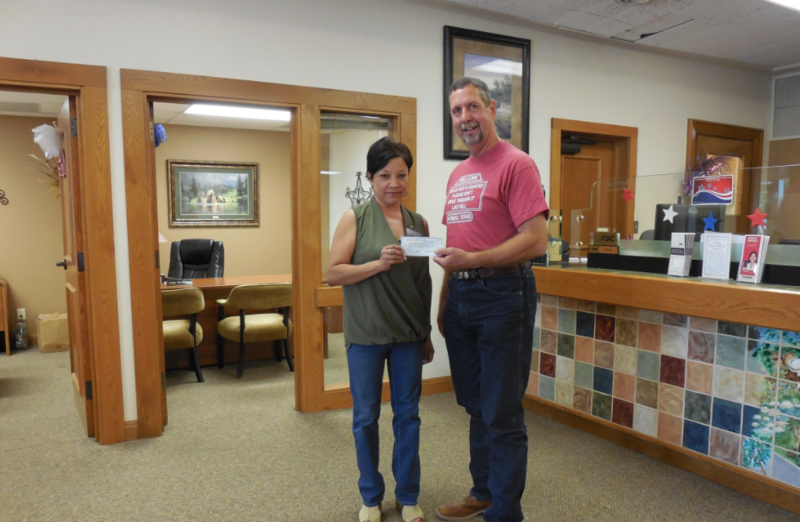 Cynthia Prieto, Southwest Gulf Railroad Community Liasion, presents checks to Bobby Ainsley, President of Hondo National Bank and member of the Library Board.